The American Pursuit the Origins of Habana Port by L.R.M. The civil war of the 1980s ripped apart the small Central American country of El Salvador. This forced a young Roberto Molina to flee his motherland along with his newly-married wife to the safe-haven and promised land that was the United States. Like the immigrants in the late 1800s and early 1900s, Roberto landed in New Orleans, the gateway to Latin America. Alone in a new country, Roberto knew he had to embrace the values of the republic, namely self-reliance, if he were to survive. Thus began the pursuit. With his innate entrepreneurial spirit, he founded a sports merchandise importing and distribution firm. Hard work and perseverance paid off and he parlayed his profits into a coffee plantation in El Salvador after the country stabilized. Unfortunately, the price of coffee dropped about 2 years into his investment and he had to salvage what little cash he had. His interests were those of a true epicurean and artisan and he met a cheesemaker who was based in Mt. Hermon, Louisiana. The partners at the fromagerie wanted to leave for Canada and Roberto convinced them to sell Chicory Farm to him. After negotiating the purchase and learning the trade of cheese-making, he built a small manufactory in Washington Parish. Again, he had to work hard and put in many lonely hours building this new empire. Soon the resurrection of Chicory Farm caught the attention of many restaurants in the New Orleans, New York and San Fransisco markets and the cheese brand was starting to take off. When Cristóbal Colón & his band came upon the new world, the natives introduced to them the devil's weed, also known as tabaco. They eventually revealed how tabaco was smoked in its most pure form: the cigar. Over the centuries it was discovered that the best tabaco was cultivated in Cuba as was evident in the Old World's voracious appetite for this most valued of commodities. Five hundred years later, Habana Port Cigar Merchants is proud to continue the tradition of providing the golden leaf to the rest of the world. 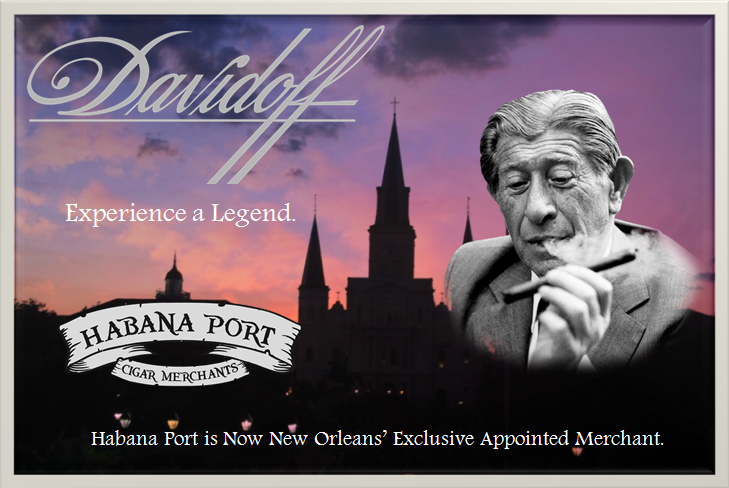 So stop by our cigar shops and browse through Louisiana's largest and most diverse selection, try some house-blended pipe tabaco or lounge in our smoking parlor equipped with comfortable seating, complimentary wireless Internet and large flatscreen TVs. We are Certified Retail Tobacconists so you can expect our staff to serve you in a professional, courteous manner and since we are proud cigar nerds, we will be glad to answer any questions for the beginner or rap about the subtleties of the industry to the professional. And since our philosophy is to act as an advocate for the cigar consumer, our prices are the lowest in Louisiana!